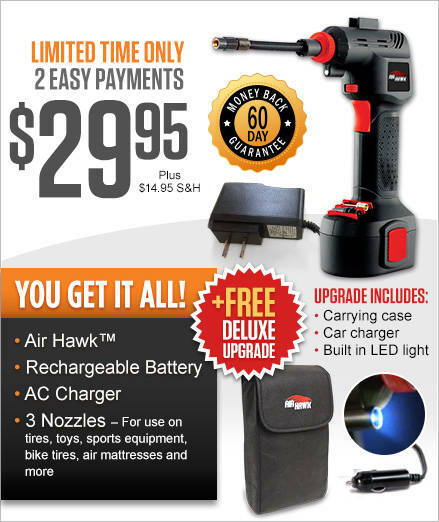 The Revolutionary New Way To Inflate Tires, Sporting Equipment, & More! We collect the domain name and e-mail address (where possible) of visitors to our Web page, the e-mail addresses of those who post messages to our bulletin board, the e-mail addresses of those who communicate with us via e-mail, the e-mail addresses of those who make postings to our chat areas, aggregate information on what pages consumers access or visit, information volunteered by the consumer, such as payment information and other information submitted when placing an order, survey information and/or site registrations, name and address, telephone number. The information we collect is used to improve the content of our Web page, used to customize the content and/or layout of our page for each individual visitor, used by us to contact consumers for marketing purposes, shared with other reputable organizations to help them contact consumers for marketing purposes, disclosed when legally required to do so, at the request of governmental authorities conducting an investigation, to verify or enforce compliance with the policies governing our Website and applicable laws or to protect against misuse or unauthorized use of our Website. If you do not want to receive e-mail from us in the future, please let us know by visiting us here. To process your payments, we may share some of your personal information with third party service providers who help up process transactions on the site. These service providers are under contract to only use your information in connection with the services they perform for us. From time to time, we make the e-mail addresses of those who access our site available to other reputable organizations whose products or services we think you might find interesting. If you do not want us to share your e-mail address with other companies or organizations, please let us know by visiting us here. From time to time, we make our customer e-mail list available to other reputable organizations whose products or services we think you might find interesting. If you do not want us to share your e-mail address with other companies or organizations, please let us know by visiting us here. If you supply us with your postal address on-line you may receive periodic mailings from us with information on new products and services or upcoming events. If you do not wish to receive such mailings, please let us know by emailing us at web support. Please provide us with your exact name and address. We will be sure your name is removed from the list we share with other organizations. Persons who supply us with their telephone numbers on-line may receive telephone contact from us with information regarding new products and services or upcoming events. If you do not wish to receive such telephone calls, please let us know by sending us e-mail at web support. We can be reached via e-mail at web support. How many Air Hawk™ offers would you like? YES! I'd like to make one convenient payment of $59.90 plus $14.95 P&H! For a limited time only, you can get this amazing Air Hawk offer for only 2 easy payments of $29.95 plus $14.95 shipping and handling. This offer is covered by our 60-Day Money Back Guarantee. Sales tax will be applied to orders from NV and NJ. A $1 web service fee will be added to each order. Non-continental U.S. orders please add an additional $7.95 shipping surcharge. For customer service, please call 800-508-6679 or email airhawk@rephelpdesk.com. To check the status of your order, please click here. ©2019 Air Hawk™ All Rights Reserved.